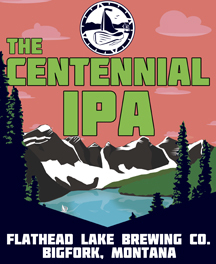 Our India Pale Ale is generously hopped with the Centennial variety in honor of the 100-year anniversary of Glacier National Park. 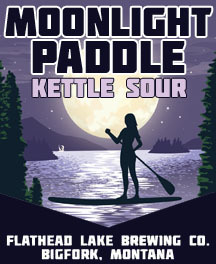 It has a floral, citrusy hop profile, and a clean malt profile that is rounded off with a dry and moderately-high bitter finish. Malts: 2-Row Pale, Wheat, Caramel, Vienna, and Honey. Hops: Zythos and Centennial. 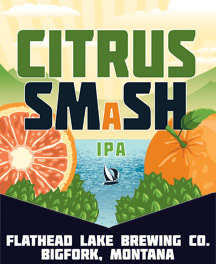 This bold IPA is made using the SMaSH technique, where one malt variety, as well as one hop variety is used. 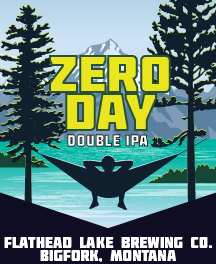 We chose Montana-grown and malted 2-row barley and Equanot™ hops, and to use grapefruit to reinforce the already citrusy and fruity notes of the hops. Malts: 2-Row Pale. Hops: Equanot™. This Northwest style Pale ale uses modern varietal hops for a distinct aroma profile that includes citrus, berry, and tropical fruit. Northwest Pale Ales typically have more hop presence then standard Pale Ale, yet are balanced by a slight malt sweetness. Malt: 2-Row Pale, Carapils, Caramel, Aromatic Munich. Hops: Mosaic®, Citra®, Simcoe®, and Willamette. This Double IPA is created for the true hop enthusiast. 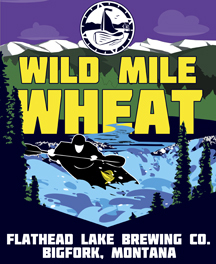 A mild malt body with mostly Montana grown 2-row allows the floral and berry hop profile to be prominent. We utilize the Mosaic® variety of hops for aroma. A big, clean, crisp finish tops this beer off at 8.2% ABV. Malts: 2-Row Pale and C-80. Hops: Columbus and Mosaic®. This light-bodied Sour Ale has a tartness created by allowing lactobacillus to act on the wort over several days in the kettle. Italian Plums add to a fruity finish for a clean balance and a refreshing, drinkable beer! Malts: 2-Row Pale, Wheat, Carapils, and Honey. Hops: Cascade. Premium Lager is the standard for American beer, made famous by the larger US breweries. We have brewed this beer to satisfy the want for a crisp, light bodied, low hopped beer that is still craft. 30% flaked corn was used in the mash to create alcohol while reducing the malt profile, the corn leaves a clean, refreshing finish with a mild smooth mouth feel. Malt: 2-Row Pale, Carapils, Pilsen, and Flaked Corn. Hops: Cluster, Fuggle, and Tettnang. 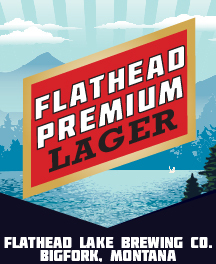 This is our lightest beer ever made at Flathead Lake Brewing Co. A crisp, highly drinkable beer fermented with both Lager yeast and Ale yeast. Shining Mountain has a low flavor profile, super clean finish, and a white foamy head.  With a light straw color, low alcohol content, and almost no perceivable hop aroma, it can be compared with the classic light beers that are so popular in America. Malts: Pilsner, Cara-Pils, and Acidulated. Hops: Perle and Ella. 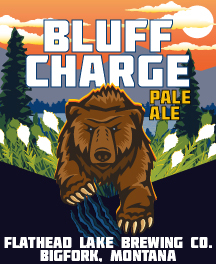 An exclusive brew for Glacier National Park. 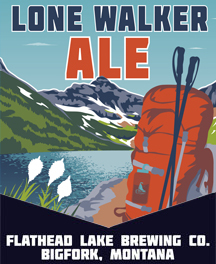 Designed to be low alcohol and high in hop aroma to appeal to the millions of visitors to our closest National Park. Lone Walker is served in the Lodges in the park only. Splendidly aromatic with the use of Citra® and Mosaic® hops added late in the boil. Malt: 2-Row Pale, Caramel, Aromatic, and Carapils. Hops: Simcoe®, Amarillo®, Mosaic®, and Citra®. Brewed as an ‘all day beer’ this lower alcohol style is not lacking in flavor or aroma! 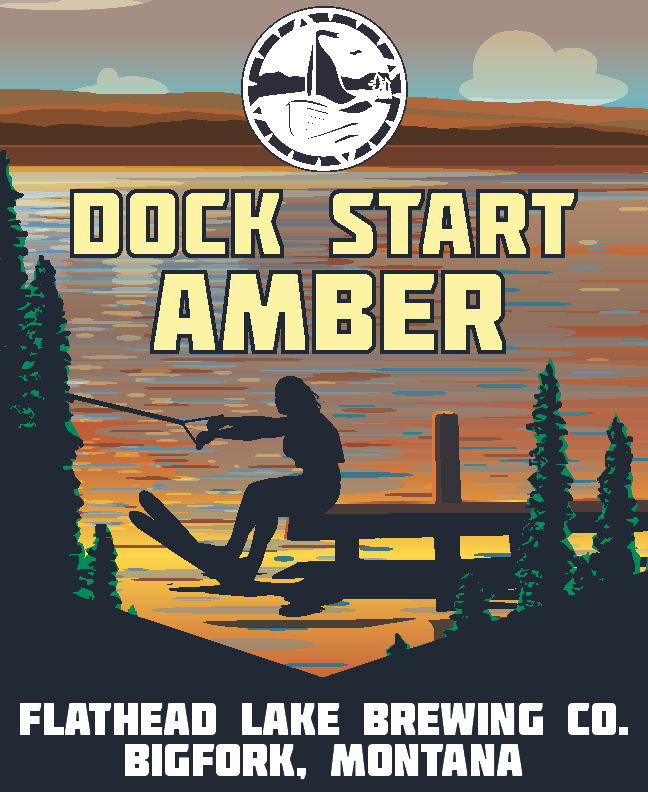 Combining the right amount of hops and malt we have created a balanced, drinkable Ale. We used classic American Hops and Montana grown barley. Malts: Aroma, Caramel, and Pilsner. Hops: Cascade, Willamette, and Simcoe®. Our crisp, approachable American-style Hefeweizen is a toast to the brave few who annually paddle the Swan River’s Wild Mile rapids. Floral aromas and a slight haze defines this style. Malts: 2-Row Pale and Wheat. Hops: Horizon and Mosaic®. 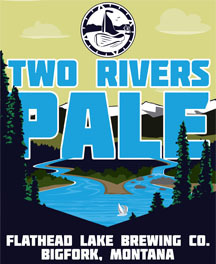 Our bright, medium-bodied American Pale Ale pays tribute to the two rivers that flow into Flathead Lake: The Swan and The Flathead. The lively pine, citrus, and floral hop aroma combines with a slight malt sweetness that lingers into the finish and compliments the bitterness representative of the style. Malts: 2-Row Pale, Caramel, Carapils, and Aromatic. Hops: Simcoe® and Cascade. 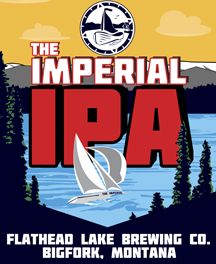 The Imperial IPA is a Double India Pale Ale that is fully loaded with Cascade hops for explosive grapefruit flavors and aroma, assertive bitterness balanced perfectly with a strong malt backbone, and a slow, smooth finish. Malts: 2-Row Pale, Wheat, and Caramel. Hops: Simcoe® and Cascade. Classic American Amber Ale that leans towards malty sweetness. A deep red color, medium body and subdued hop profile makes this a great year round brew. Well balanced and a local favorite. Malts: 2-Row Pale, Wheat, Caramel, and Chocolate. Hops: Golding and Fuggle. 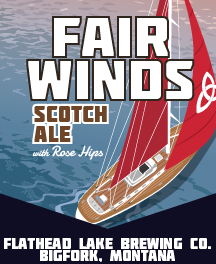 Scotch Ale is a malt focused, generally caramelized beer with a slight grainy and bready finish that is balanced by a herbaceous hop character. Relatively rich malt presence with a smooth hop profile makes this a very drinkable, medium bodied beer. Malts: 2-Row Pale, Caramel, Victory, Wheat, and Munich. Hops: East Kent Goldings. 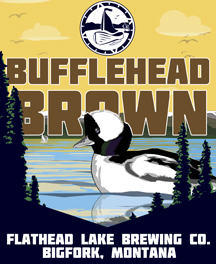 Our well-bodied Brown Ale honors Flathead Lake’s small American sea duck, famous for its buffalo-like head. Roasted and caramelized malts mingle for just the right touch of sweetness. An aroma and flavor with hints of chocolate, coffee, black bread, and a little nuttiness. Malts: 2-Row Pale, Wheat, Caramel, Chocolate, Black, and Biscuit. Hops: Goldings. A Robust Porter. Full bodied with a complex and flavorful chocolate malt character and aroma. Our porter is black in color yet soft on the palate. Malts: 2-Row Pale, Caramel, Chocolate, and Black. Hops: Cluster and Golding. 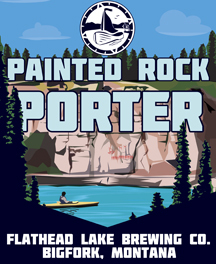 Take our Painted Rock Porter and add a coffee blend from our local roaster, Fieldheads Coffee Company, and you get a rich, chocolaty, perfectly balanced ale that’s black in color and remarkably smooth. 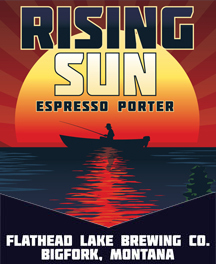 Maybe not ideal for first thing in the morning, but drinking it does bring to mind a beautiful sunrise on the shores of Flathead Lake. Malt: 2-Row Pale, Caramel, Chocolate, and Black. Hops: Cluster and Golding. Very drinkable by design, this beer is brewed with Rolled Oats for a creamier mouthfeel. 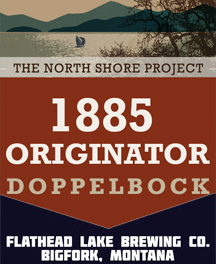 We gave hints of vanilla and sarsaparilla to smoothly balance the bitter, sweet, and roasted character. We brewed this beer in collaboration with Fun Beverages’ Andy Kriss. Malts: 2-Row Pale, Caramel, Dark Wheat, Roast, and Rolled Oats. Hops: Zythos, East Kent Goldings, and Willamette. American Stout. 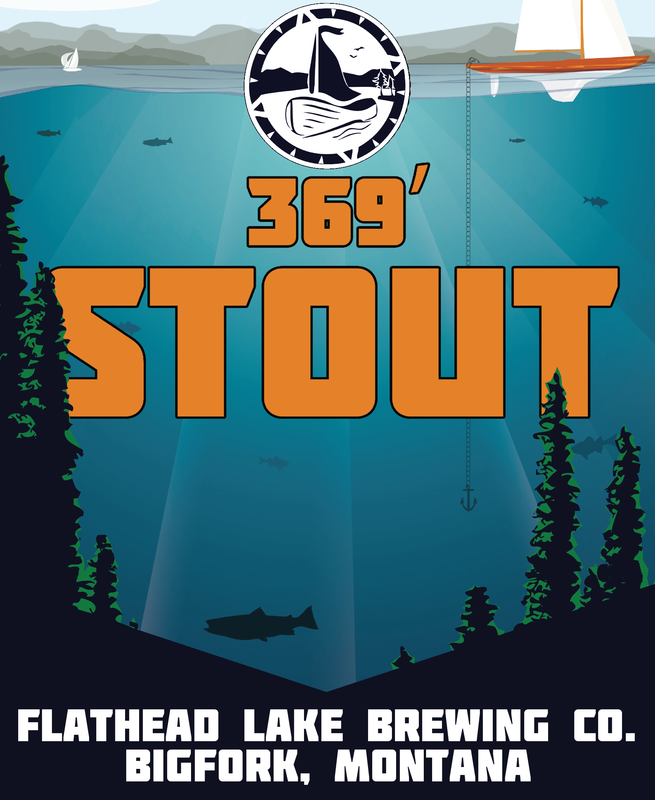 Our 369’ Stout takes its name from Flathead Lake itself – its deepest point. Creamy, malty, and full-bodied with a hint of crisp bitterness. Also served on Nitro, making it creamier and more full-bodied. 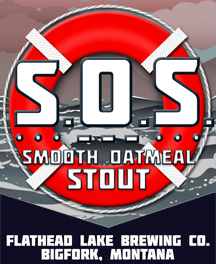 Oats, caramel, and roasted malts give our Stout its deep, dark color and pronounced roasted flavor. 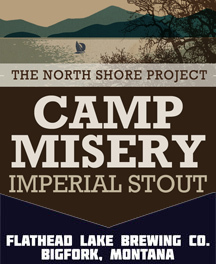 Malt: 2-Row Pale, Caramel, Chocolate, Roasted Barley, and Oats. Hops: Simcoe® and Cascade. While groomers are great, the backcountry beckons with promises of high adventure and stashes of pristine powder. 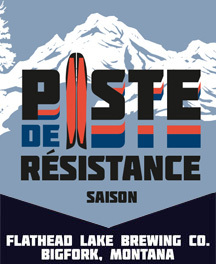 To celebrate those who resist the temptation to stick with the known, REI Co-op and Flathead Lake Brewing Co. present Piste de Résistance Saison. 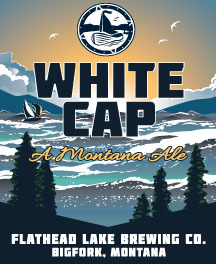 10% of sales from this beer go to support the Friends of the Flathead Avalanche Center. The Belgian yeast strain produces loads of fruity esters, with clove and banana in the forefront. We then added Blood Orange for a fresh take on this classic style. Malts: Pilsner, Wheat, Munich, and Vienna. Hops: Tettnang. 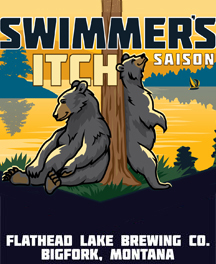 Our Belgian-style Swimmer’s Itch Saison is a liquid ode to summertime on Flathead Lake. Swimming in the lake in the summer is one of the greater adventures of living in the Treasure State. The Belgian yeast strain produces loads of fruity esters, with clove and banana in the forefront. Sweet orange peel and coriander add a citrusy/spicy character that rounds out this classic style. Malt: Pilsner, Wheat, Munich, and Vienna. Hops: Tettnang. Take one Belgian Strong Ale, add a subtle smooth flavor from midnight wheat malt, fresh ginger, and lemongrass. What do you get? 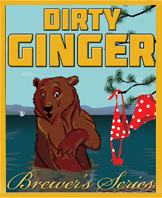 Dirty Ginger! The aroma and flavor run complex: ginger and alcohol warming, lemongrass and ginger flavors in this black Belgian beer. Malts: Pilsner, Wheat, Munich, Black, Oats, and Sugar. Hops: Golding. A beer that is commonly referred to as a meal in a glass! 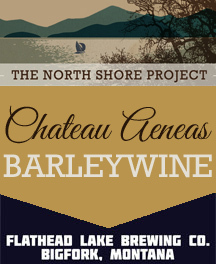 This North Shore Project installment was aged in oak casks for four months. A bold malt body, medium to dark brown color, and higher alcohol defines this German style Lager. 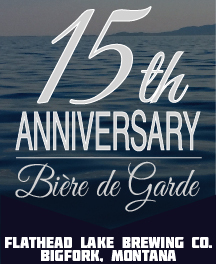 Named for the year the original homestead and orchard was established in what is now known as Bigfork, Montana. Pair this beer with your favorite dish for a proper meal. Malts: 2-Row Pale, ESM, Rye, Munich, and Wheat. Hops: Columbus, and Tettnang. Black as they come. Thick and rich with roasted barley and molasses flavor. Subtle whiskey notes are present as well as Vanilla and Chocolate. Aged in oak for 6 months to a year. Malts: 2-Row Pale, Black, Roast, Munich, and Wheat. Hops: Columbus and Horizon. A beer that is meant to have wine attributes. Aged in red wine barrels for a year or more. The wine barrels add color, oak flavors, wine, and berry notes. A strong clean tasting big oak beer. 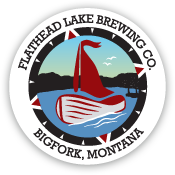 Named for the highest peak in the Jewel Basin where views of the Flathead Valley are well worth the hike. Malts: 2-Row Pale, Vienna, Pilsner, Aromatic, and Turbinado Sugar. Hops: Horizon and Tettnang. 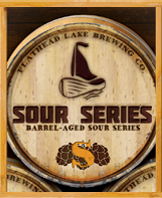 We create a variety of sour beers, these beers are brewed with wild yeast strains and bacteria that create a genuinely unique flavor profile. The beer is aged in oak casks and inoculated with Brettanomyces, Lactobacillus, and Pediococcus. Local fruit can be added such as cherries, plums, apricots, or currents. We will continue to release unique beers in this style.